Israel fought “an exemplary campaign” during the Gaza conflict last year, an independent group of prominent military personnel and a former United Nations war crimes prosecutor has concluded. The group unanimously agreed that Israel’s military response was reasonable. The study was compiled this summer during six fact-finding and research trips. The actual report includes some details that, as far as I know, were not previously made public. 186. A comprehensive protocol exists in the IDF to assert LOAC compliance during active hostilities, no matter how complex the battlefield. This was clearly evidenced during our fact-finding. In particular the HLMG was able to consider in detail IDF targeting practices and those as related to operating around sensitive sites, two of the most controversial aspects of Operation Protective Edge. 187. Where the IDF prepares pre-planned targets for attack against military objectives, it follows a multi-stage process for approval in order to ensure LOAC compliance. The procedure consists of the collection of intelligence about the potential target in order to ascertain that it constitutes a valid military objective and that the conditions for proportionality are met, as well as to assess any civilians, infrastructure or sensitive sites that may be affected by the attack. Commanders then determine objectives in regard to the target on the basis of this information. Here conditions can include the extent of destruction warranted, the necessity of enemy presence and similar considerations. Separately, operational planners may also advise on options for a specific attack, geared towards the further minimisation of collateral damage for example. Officers then examine all parameters and make a professional assessment of the target. This includes a binding assessment by a legal adviser about the legality of the attack and any necessary stipulations. Commanders may add additional conditions beyond legal considerations; and the input provided into the decision by the various different organisations, such as intelligence or operational planning, is updated and re-evaluated on a timely basis in advance of any attack. A senior commander will ultimately review the information before an attack and approve it, if necessary subject to certain conditions; suspend action pending further input regarding parameters that are insufficiently clear; or decide not to attack the target at that time. 188. The process of ensuring LOAC compliance of IDF attacks is in most cases aided by what the IDF refers to as a Target Card, a standardised document which centralises all the above information into one place so that the commander may make an informed decision. 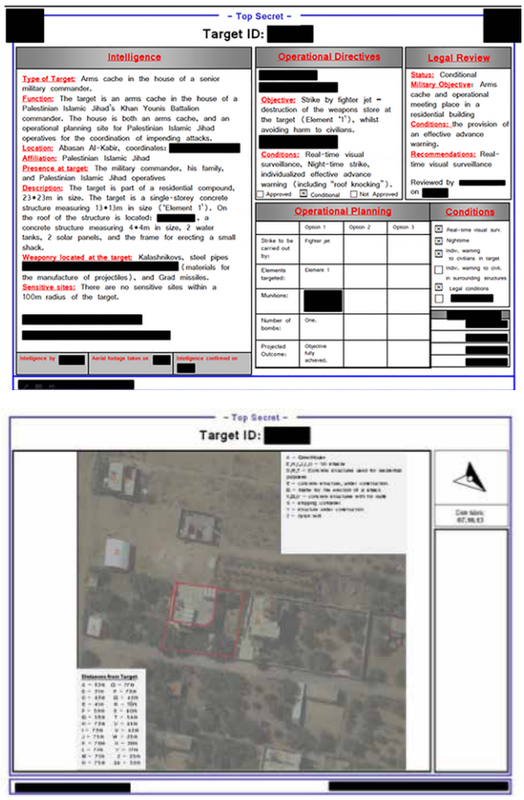 The Target Card contains relevant intelligence, including imagery, an assessment of the military value of the target, options regarding operational plans as well as a binding legal opinion regarding the intended attack’s compliance with LOAC. 189. Some of the members of the HLMG expressed explicit concerns that these procedures are excessive, and that they are not necessary, particularly when the IDF is educated in the application of the LOAC throughout their training. They expressed concern in particular that these elaborate procedures may establish an unwarranted precedent that yields significant advantage to an adversary that intentionally violates LOAC to achieve tactical, operational, and strategic advantage. 190. Where the acute realities and necessities of combat prevent real-time legal input and do not allow for such a deliberative targeting process, for example during intense air and ground combat operations or other specific situations where targets are highly time sensitive, commanders are instructed to be diligently reliant on their training, specific relevant directives and other relevant actors to ensure their compliance with all aspects of LOAC. In relation to so-called sensitive sites – that is, objects that are considered to have special protection from attack under LOAC or warrant special consideration on account of policy decisions, such as for example, hospitals, schools, religious sites, large food factories, power stations and UN facilities – detailed regulations exist in the IDF to ensure their appropriate safeguarding. Notice of the location of sensitive sites is distributed to all levels of command, and updated on a real-time basis by a specific officer tasked with ensuring the real-time data is up to date. This data is widely accessible, including to relevant commanders in the field. There are limited circumstances in which sensitive sites may be damaged, either on account of an attack in their proximity, or directly in circumstances where they are legitimate military targets on account of their use for military purposes thus invalidating their protected status. These instances are governed by detailed IDF regulations that mandate precautionary measures and require attacks to be granted specific approval by a high ranking officer. Depending on the type of target and attack, this approval can go all the way to the Chief of Staff and, in certain extremely sensitive cases, to the Minister of Defence and even the Prime Minister. You will never learn this from reading reports from the UN or Amnesty or HRW. They write their reports with the conclusion that Israel acted recklessly as the initial premise and all evidence is chosen to support that premise. warfare pose a concern to all democratic nations. compliance with the Law of Armed Conflict. Critics will point out that this study was facilitated by the Friends of Israel Initiative and the director of that group – Rafael L. Bardají – is also one of the members of the HLMG, with the qualifications of being a former National Security Adviser in Spain and many other impressive achievements. But the other members of the group cannot be said to be biased; all have formidable experience in the military and in national defense for their respective countries. The report itself is detailed and does not have a whiff of bias in its presentation. But since Israel’s critics have little to stand on, they will dismiss this because it is sponsored by a Zionist group, while pretending that Amnesty and HRW aren’t biased. Where are the amateur videos of the Golan riots?